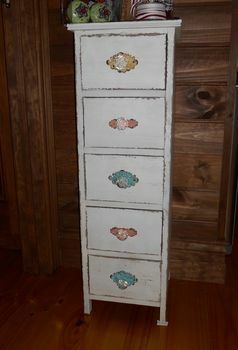 rustic cream set of drawers- 38"(96cm) high, 13"(33cm) wide, 12"(30cm) deep. luscious little coloured back plates , vintage pink/lemon/aqua-blue, lovely little fluted glass handles. imagine all your precious fabrics or special bits in this!!!! Limited quantity!